You’ve seen the movies. Every 1950s diner had a jukebox! In fact, entertainment “props” like jukeboxes have a long history of being part of — if not a focus of — the attraction of physical businesses. There were, for example, 1980s arcades. Or today’s e-game bars or board game restaurants. Or you might find a gas station with a few slot machines for people to play while they take a break from driving. The thing with gambling, though, is that is often heavily regulated. 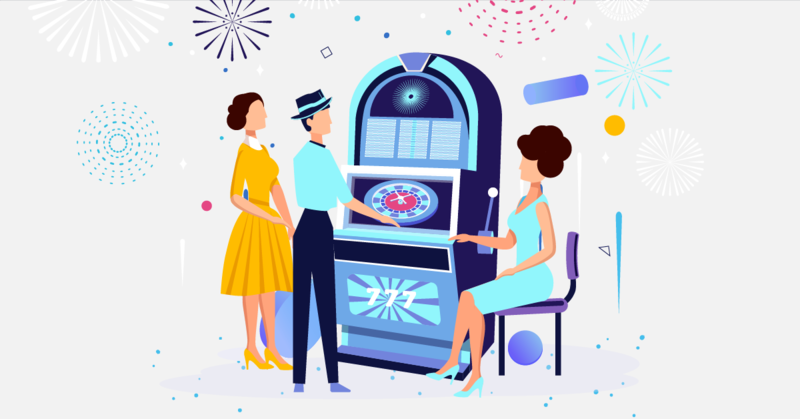 From a traditional regulatory perspective, offering electronic slot machines or other forms of “video gambling” — a term obviously coined a few decades ago :) — has not been so easy as offering a jukebox or arcade game for your clients. And that’s too bad. Because people love to gamble. Maybe even more than they love to play video games. According to trade association reports, the video gaming industry had revenues of $36 billion in 2017 while the gambling industry had $40 billion in the same year. Both industries are experiencing huge popularity — but only gambling is getting all the regulation! Radically fair gambling is in a sweet spot between prestige and practicality for physical businesses wanting to delight customers. As we wrote about before, gambling isn’t necessarily gambling, legally speaking. Most legal definitions of and technical regulations of gambling involve businesses generating a profit on gamblers’ wagers, fiat currency transactions, or both. BlockStamp Games’ radically fair gambling platform doesn’t involve either of these typical legal “trigger points.” Players are the only ones who profit, all losses are lost to everyone, and all transactions are done in the BST crypto currency. From a practical perspective, it would seem that offering this sort of gambling to patrons of a restaurant, for example, would be no different than offering arcade games. It might even be easier — because arcade games typically generate some kind of profit and could require some form of licensing. BlockStamp Games can’t generate any such profits. Verifiably! We’ve written before about how BlockStamp Games is an open source platform. Anyone can build on top of the platform to suit their own unique needs. One of those needs might be to attract consumers to the next generation of physical retail spaces. Imagine, for example, in a Männergarten you’ll find video games on the console, sports on the TV, and radically fair roulette on a touchscreen virtual wheel! As usual, we’re not exactly how this is going to play out. Traditional retail is getting disrupted. It is not longer just about “taking care of business,” i.e. getting the products at the best prices. You can do that better online. It is more about “making an occasion of it” and having a fun experience. Some Chinese supermarkets are experimenting with in-house restaurants, for example. Go figure! Anyway, we believe that gambling can be a great add-on to a day of fun shopping. And now it can be easy for retailers to provide this add-on.